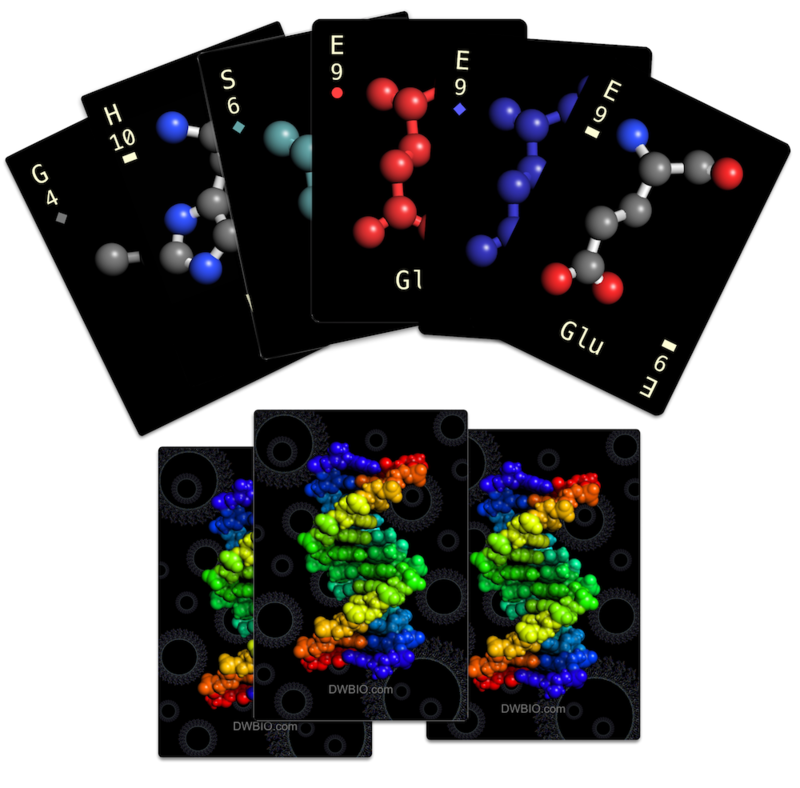 The Amino Rummy™ deck contains three suits with 20 amino acids in each. The three suits show amino acids colored by their composition (element) or properties (charge or hydrophobicity). Atoms in the element suit have unique colors: carbons are grey, nitrogens blue, oxygens red, and sulfurs, yellow. The charge and hydrophobicity suits show chemical properties. Each amino acid’s one-letter symbol is shown in a corner with the three-letter abbreviation below the image. The number of visible atoms is shown underneath the symbol for the suit. The element suit has a bar, the charge suit, a circle, and the hydrophobicity suit, a diamond. 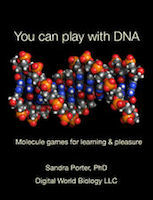 Ball & stick models of amino acids are shown in the form found in protein models. Hydrogens are missing because these amino acids come from crystal structures. These cards can be used for games like Amino Rummy, Amino Fish, Crazy Charges, Amino War, and Amino Cribbage, or you can make up your own games. Color keys help identify the atoms or amino acid properties, depending on the suit. Each card is 2.5 x 3.5 inches in size.